PERFECT GIFT FOR THE MUSTANG ENTHUSIAST IN YOUR LIFE! Do you know a Mustang Enthusiast? A Mustang Enthusiast would be someone who shows the following characteristics: Talks about Their Mustang Constantly, Calls their Mustang their "Baby", owns one or MORE Mustangs, or ALWAYS looking to Upgrade some parts on their Mustang (also known as their "Baby"). I bet that you have a hard time sometimes searching for this person the PERFECT gift that they will love ALMOST as much as they love their Mustangs! Prestige Mustang has the solution for you! We now offer Gift Certificates for purchase. Our Gift Certificates can be purchased in any amount you desire for any occasion you desire! Christmas, Thanksgiving, Birthday, Halloween, Anniversary or Just Because.... A Gift Certificate for Mustang Parts will ALWAYS be the BEST gift for any Mustang Enthusiast! Prestige Mustang will also include a special message of your choice (If this is something you wish to add). We can also customize the appearance of the Gift Certificate to match the occasion you are purchasing the certificate for! Availability: Please call to Purchase! 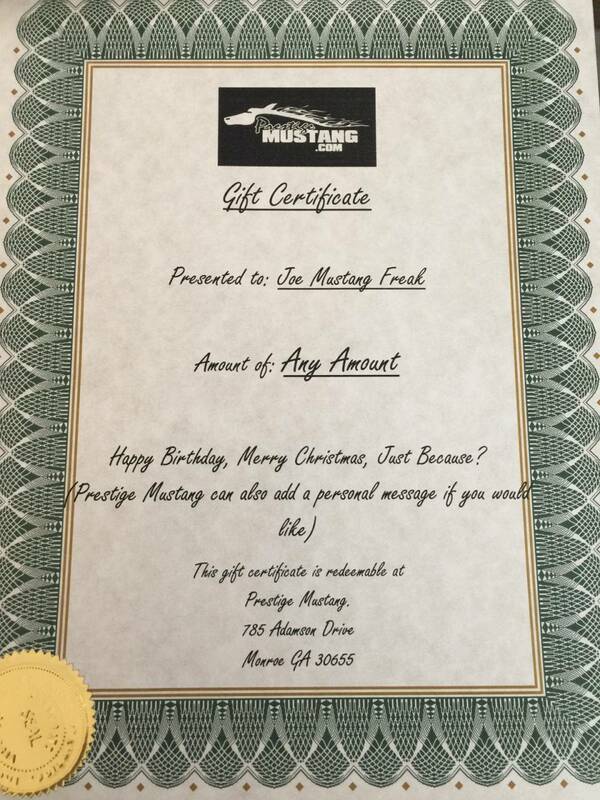 Prestige Mustang Gift Certificates are ONLY redeemable at Prestige Mustang. All Gift Certificates are stamped with a seal of authenticity. If you have any questions about purchasing or redeeming a Prestige Mustang Gift Certificate please feel free to give us a call. Above you will see an example of what the Gift Certificate looks like! Availability Remarks: Please call to Purchase!